Carl Theodor Dreyer is one of the more gentle directors to rise from the Scandinavian art house and a man who’s work in general showcases a sensuality and delicate touch that would leave many of his contemporaries completely enamoured. With the exception of his often-praised emotional tour de force La Passion de Jeanne d’Arc, Vampyrcomfortably stands as the directors crowning celluloid achievement. 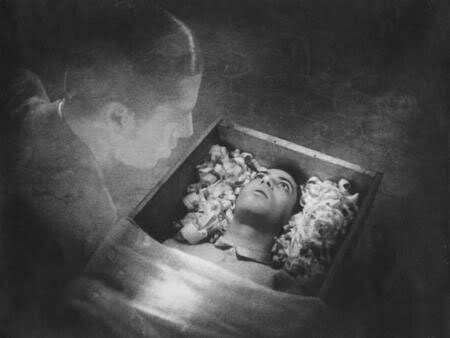 During the period that Vampyr was made (1932 to be exact), film was undergoing a drastic but monumental shift from silent to sound pictures. The transition was far from smooth and is well documented as being chaotic but it’s clear from the early sound films that visual integrity was being sacrificed for what some saw as the latest fad. A lot of the films from the era, especially Hollywood, are slow and extremely rigid with cameras being stuck in case they made a sound. Vampyr can be seen as Europe’s first attempt to bring these new ideals in without the sacrifice of the strong visual tapestries that had been moulded to perfection, especially during the German expressionism movement of the previous years. Providing a handy lexicon of imagery for future horror cinema to copy and reproduce,Vampyr is iconoclastic in a way that Tod Browning’s Dracula (made only the year before) simply cannot match. For all the charm that Browning’s picture has, Dreyer’s take on the supernatural; brings a new element of suggestion, showing visual puzzles of what could potentially be happening to our characters but never truly revealing them until the very final moment. Twisting our expectations into something that both analyses mysticism and the appearance of evil, the film seems determined to scare yet only through unnerving its main character rather than a typical BOO! Vampirism is presented as a disease, an illness perhaps that drives its victims to madness, yet this is again shrouded in imagery that seems common place in the horror cinema of today. Whether it’s the silhouette of a scythe or the rattling bones of a skeleton, every second of visual is there to create dread in protagonist, Allan Gray’s world. While mixing silent and sound cinema together, the film also mixes its visual ideas together too with Dreyer’s simple and cold white walls mixing with the crooked corridors and stairways of the previously mentioned German expressionism. This produces a highly new and visually original film that sits comfortably in both Dreyer’s and the expressionist’s cannons. This becomes especially apparent in the change between rooms where one appears to be a white wash, minimalist space which then changes to a Langian style study before the adventure takes Allan to a storehouse full of chains, shadows and ladders casting shapes and angles straight from Das Cabinet Der Dr. Caligari. The shadows in particular play a vital role, both to the story and success of the film. They are obviously a wonderful element to play with visually but the narrative gives the shadows of people a life of their own. Deciding to detach themselves, they run away perhaps suggesting the lack of trust the characters have in themselves, though shadows of all sorts seek new life throughout the film and play a key role in the overall narrative. The shadows lead nicely onto the more ghostly element of the film, yet another aspect of horror cinema covered successfully. Allan leaves his body and is presented with terrifying visions of death and funerals though whether this is an act of the supernatural or whether it is a dream is unclear. This also predates the famous dream sequence from Bergman’s Wild Strawberries and almost predicts Bergman’s intentions to portray dream as a form of metaphorical prophecy twenty years before creating a wonderful irony. In fact, due to Allan’s passionate interest in the occult, it’s very tempting to read the film as simply an extension of his imagination. Perhaps in his desperate attempt to find occult happenings, he dreams them up himself, giving him a range of every possible super natural occurrence. However it’s far from clear and this reading ignores the fact that the villain of the piece genuinely does die from drowning in grain while the liberation of the damsel’s soul that happens after the staking could be seen as any sort of emotional overcoming. This Masters of Cinema release through Eureka entertainment is yet again filled to the brim with extras. As a film that Hitchcock himself said was “the only film worth watching twice” it simply demands extras and lots of them. The restoration in particular is a triumph and segments of the film containing sound are clearer than any other previous release. A documentary by Jorgan Roos is contained as well as a massive 80-page booklet giving the viewer every detail they could possibly want to know about the picture. However the highlight of the extras is really the commentaries. The first is by film scholar Tony Rayns who adds yet more information and analysis of the film if the documentary and booklet left you wanting more. However it is the commentary from director Guillermo del Toro that is the real treat and is a perfect way to see how the film has influenced even modern takes on the genre today. Dreyer is a director who appears to have dipped under the radar in recent years. With so many strong European directors of the same era all coming under constant analysis, the magnitude of Lang and the personal touch of Renoir perhaps swamp this most sensual of directors. However his work is constantly refreshing and Vampyr is the perfect film for that heady mix of mysticism and gentle scares. Tagged Adam Scovell, car dreyer vampyr, Carl Dreyer, carl dreyer director, carl dreyer films, Carl T Dreyer, Celluloid Wicker Man, dreyer vampyr, early horror, early horror film, Film, Film Blog, film essays, film essays online, Film Review, Film review blog, film review site, film review website, film site, Film website, Horror Film, Masters of Cinema, masters of cinema dvd, masters of cinema vampyre, silent horror, Vampyr, vampyr 1932, vampyr analysis, vampyr essay, vampyr review, vampyre masters of cinema, World Cinema, world cinema blog, world cinema reviews, world cinema site, world cinema websites, World Film, World film blog, world film site, world film website, world horror film. Great blogging & a thousand thanks for bringing this movie to my attention. It’s surprising sometimes what flies under the radar!